My computer just crashed. I got the blue screen of death after one of those “Oh, hey, you need to update your Windows 10” messages. It crashed as I was writing for this blog and it didn’t save. Does it ever? The computer took its time rebooting and gathering data. I had a choice between hitting my head on hard surfaces in frustration or putting away laundry. I chose the latter, despite the lure of the former. It was not so long ago I suffered from terrible writer’s block. There are various theories about writer’s block: That it’s just fear. That it can be cured by writing. That it can be cured by not writing. None of it worked for me. I just had to ride that wave, and a long wave it was for this non-surfer. Words trickle these days, but they are there and I am patient with them and myself. I pay attention and nurture little idea shoots into whatever they want to be. Most need a lot of time in a nursery. That I can give them, because my days are filled as well. My writing right now feels like creative place-holding, just doing enough to keep momentum and keep the muscle from atrophying. There are few swooping pieces these days. A thousand words can take upwards of two weeks to write, edit, nourish, discipline, and release. Sometimes more. It is deliberate. But it gets done. There is satisfaction in hitting “submit” or “send” and the time seems well-spent if not painful. This year will be one where the creative work will need to share a table with other responsibilities. Little birds peeping and opening their beaks wide, needing to be fed and cared for. Sometimes wonderful work. Sometimes thankless. Sometimes out of love. Sometimes out of something that is something similar but not quite love. It all feels very adult. The writing, though, is childlike and playful, young and fearful, boundless, untethered, straining against sitting at the table at all. I give it what I can – room, time, energy. There will be so much more of all of that in a year. Or maybe two. For now, I have ideas and routine and desire. It’s more than enough. The only thing I don’t have now is the time to hover above or float beneath my own life, observing and reflecting and creating from there. There are no long moments of decadent moodling. There are few opportunities for the luxury of leisurely crafting. It all feels so very furious and demanding. The writing part of my life is having a bit of a tantrum. I don’t know if I can teach the writing part to be a little more patient, to sip instead of gulp. I’m not sure I want to. 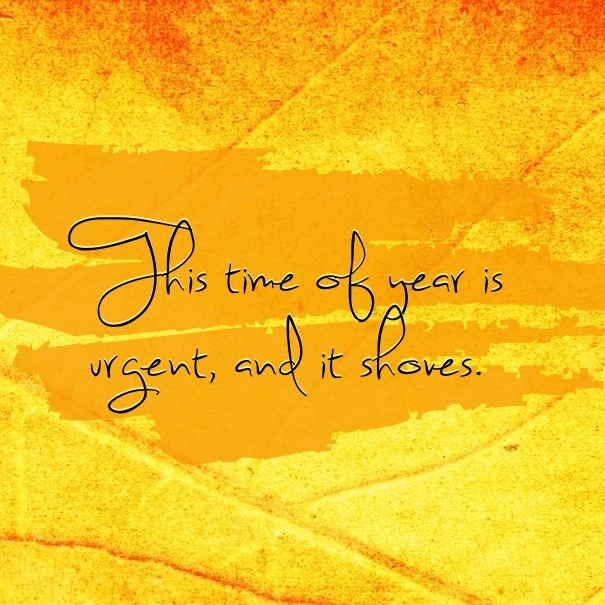 This time of year is urgent, and it shoves. It is a time of reflection and beginnings. My husband’s birthday, our anniversary, my own birthday, all within the next few weeks. We take stock, we atone, we keep, and we plan. We look where we’ve landed and at how worn our shoes have gotten. Do we need to adjust the path? The shoes? But I’m not blocked. Sometimes things just crash and you have to wait for everything to restart at its own pace.